Poor Will Shakespeare (Joseph Fiennes) has lost his gift and his quill is wordless. Even his muse Rosaline can’t help him complete his new play Romeo and Ethel the Pirate’s Daughter. All seems lost until he meets and falls in love with the beautiful Viola de Lesseps (Gwyneth Paltrow), a noblewoman who adores the theatre. Unfortunately Viola is promised to the vile Lord Wessex (Colin Firth), but before the wedding she disguises herself as a boy and auditions for the part of Romeo. As they play out their own tragedy, Shakespeare uses their love as inspiration for his play, now entitled Romeo and Juliet. 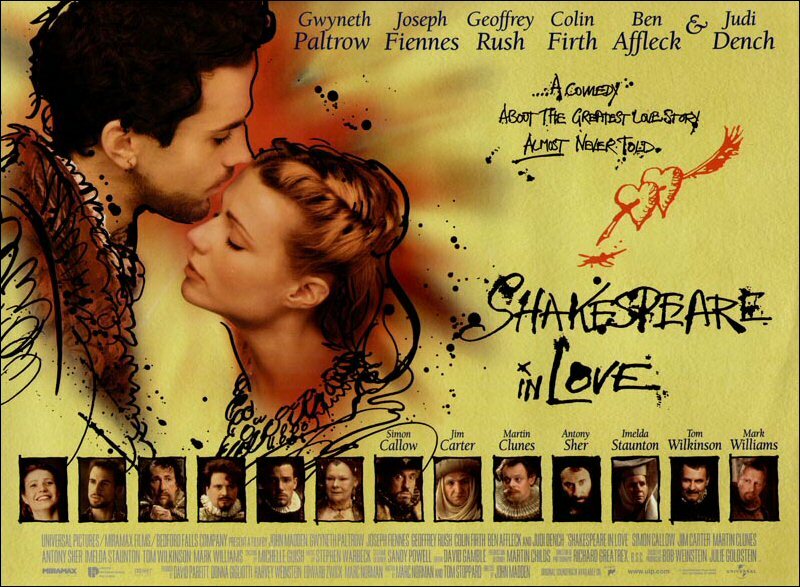 Shakespeare in Love is a true classic combining comedy, drama and romance. Set in 16th century London, the theatre scene looks as vibrant as it is today. With an all-star cast including Geoffrey Rush (a hilarious Fennyman), Martin Clunes (Burbage) and Simon Callow (Tilney), plus Judi Dench’s Oscar-winning performance as Queen Elizabeth I, the film puts a new twist on the life of the Bard. It’s another film where poor Colin Firth gets a rough deal, but he is wonderfully chauvinistic in his portrayal of Wessex. Ben Affleck is perfect as Ned Alleyn, the arrogant yet charming actor and Imelda Staunton provides additional comedy as the nurse, particularly when she is covering for the lovers. Rupert Everett also makes an appearance as Christopher Marlowe, Shakespeare’s friend and rival, who helps him sort out his sonnets and revise his Romeo. Gwyneth Paltrow and Joseph Fiennes are fantastic, he a suave pained writer leading a double life and she a woman with no say in her future, succumbing to the charms of a player. As Thomas Kent she speaks Shakespeare’s verse with power and emotion, although it is the final scenes of Romeo and Juliet where we really appreciate both Fiennes and Paltrow’s acting ability. Sandy Powell’s costumes are exquisite, perfectly capturing our imagination of the time. They are perhaps a little extravagant, considering that many of the cast are ‘humble players’ but they really add to the film’s vibrancy and magic. The whole concept enriches our opinion of Shakespeare and brings a new dimension to the audience as we traverse film and theatre in this familiar, yet new tale of star-crossed lovers.